Bangladesh Krishi Bank Senior Officer Job Circular 2016 has been published. Recently a job notice has been published under the Bangladesh bank for the Bangladesh Krishi bank officer requiting. According to the notice Bangladesh Krishi Bank has been requite 704 officer in their different branches. Bangladesh Krishi Bank Senior Officer Job Circular 2016 has been published in the official website of Bangladesh Bank and National daily newspaper. If you are interested and eligible for this post then apply now. Bangladesh Krishi Bank (BKB) is a 100% government owned specialized Bank in Bangladesh. Krishi means Agriculture. Since its inception, BKB is financing in agricultural sector remarkably. BKB also performs commercial banking. People working abroad can easily send money home through our Taka Drawing Arrangement. Recently they are published a job circular for the post of Senior Officer. In this reason they are call for application to all Bangladeshi citizen. Bangladesh Krishi Bank Senior Officer Written Exam Will be held on 20th January 2017. Krishi Bank Job Senior Officer Viva Exam Schedule. Application Start Date: 28th August 2016. Salary Scale: 22,000 to 53,000 Tk and other facility according to scale. Application Deadline: 29th September 2016. Age Limit: Not more than 30 years and 32 years for freedom fighter soon and disability quota. Educational Qualification: Minimum a Master’s degree from a recognized university or 4 years bachelor’s degree or equivalent. Candidates must have at least 2 First class/division or equivalent in secondary and higher secondary or equivalent examination. Any 3rd class/division will not be allowed at any stage. 1st/2nd and 3rd class count system in SSC and HSC or equivalent exam. If you are a new user then click this link for apply. If you are a register user then click this link for apply. Application Process: Candidates must be applied to Bangladesh Bank online application form. You go to www.bb.org.bd. If you want to apply from this site then simply click below link. Then follow the instruction. After finish the application formality the authority give you a tracking ID number. You must be save this ID number for the next time. Selection Process: Candidates at first faced to MCQ and Written exam. Who passed the MCQ and Written exam they are face to viva-vice exam. If you need any kinds of information then go to Bangladesh Bank Official website or Bangladesh Krishi Bank official website. You can also visit our site to other information in future. 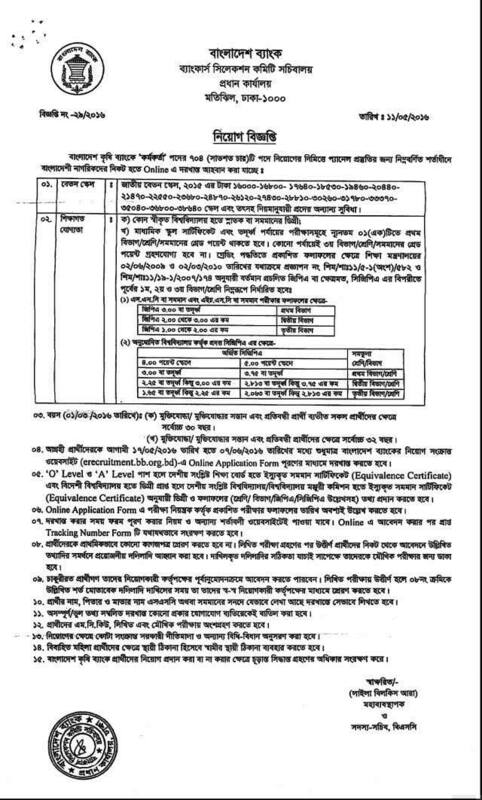 Bangladesh Krishi Bank job circular, Apply Bangladesh Bank job circular, How to apply Bangladesh Krishi Bank Job, Bangladesh Krishi Bank Admit card download, Bangladesh Krishi Bank exam date, Written exam result, BKB MCQ exam result, BKB Written exam date, BKB Written exam result, Bangladesh Krishi Bank seat plan etc. Then you are come right place. We update all kinds of information of this post. So stay with us for farther information.